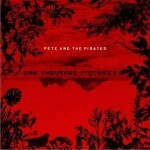 Pete & The Pirates are an English indie rock band from Reading . Their first full length album Little Death was released on 17 February 2008. The band consists of Thomas Sanders (vocals), Peter Hefferan (vocals and guitar), David Thorpe (guitar), Peter Cattermoul (bass) and Jonny Sanders (drums). They have extensively toured the U.K and Europe. In February 2011 it was announced that the band would release their second album, titled "One Thousand Pictures" in May 2011.